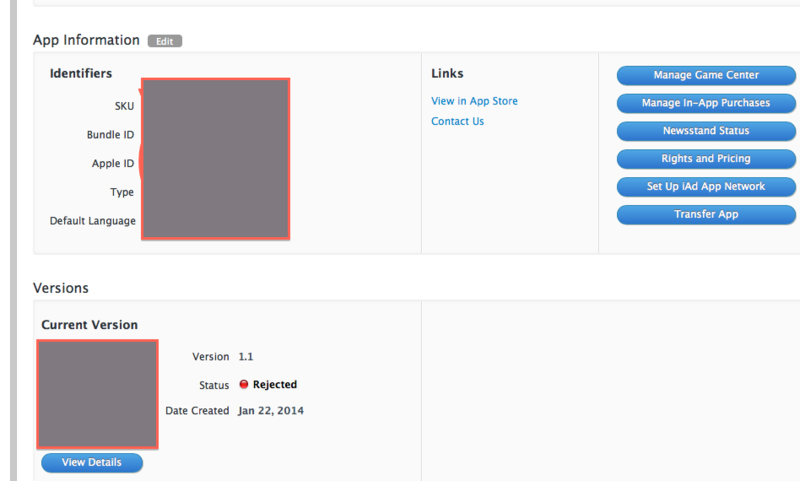 I submitted a brand new app to AppStore and it got rejected by the Lords ... (nothing new there). What I want to do is delete that app completely from my itunesconnect account. I don't know what apple recently changed but in the past once the app was rejected I use to see a "delete" button on the summary page. Now I don't see one anymore. I even checked Apple official documentation HERE and that too says that I should be able to delete it from appstore using delete button as long as the app is in reject state but the delete button is no where to be found. I already tried removing it from all territories under "rights & pricing" and availability date is in the past Jan 22nd, 2014 ... still no delete button is visible. Note: there were no in-app purchases or game center. Edit December 2018: Apple seem to have finally added a button for removing the app in certain situations, including apps that never went on sale (thanks to @iwill for pointing that out), basically making the below answer irrelevant. Currently (Edit: as of July 2016) there is no way of deleting your app if it never went on sale. However, all information except for SKU can be edited and thus reused for a new app, including the app name, Bundle ID, icon, etc etc. Because SKU can be anything (some people say they use numbers 1, 2, 3 for example) then it shouldn't be a big deal to use something unrelated for your new app. Here's the answer to my question I got back from Apple support. 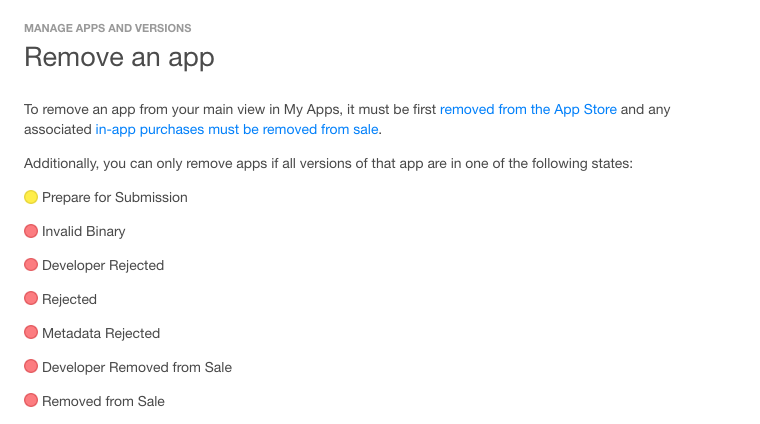 You can only delete an app from the App Store if it was previously approved (meaning has one approved version). Apps that have not been approved yet can’t be deleted; instead, reject the app. As of 2016, new changes have been made to iTunes Connect. 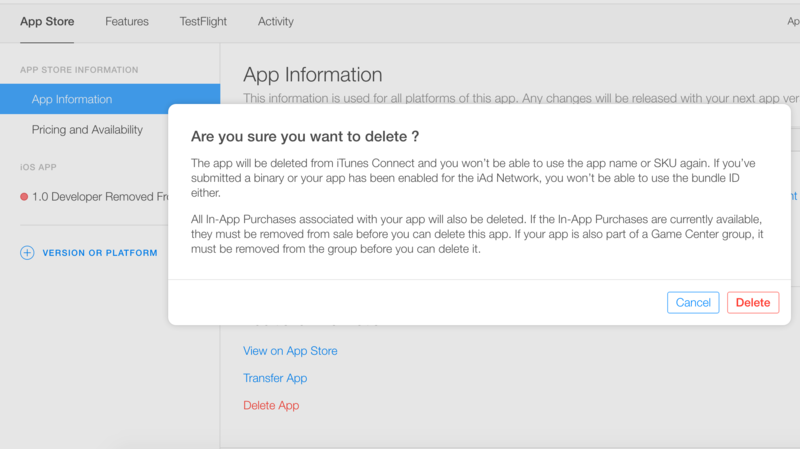 Here are the screenshots of deleting an approved app from your account. 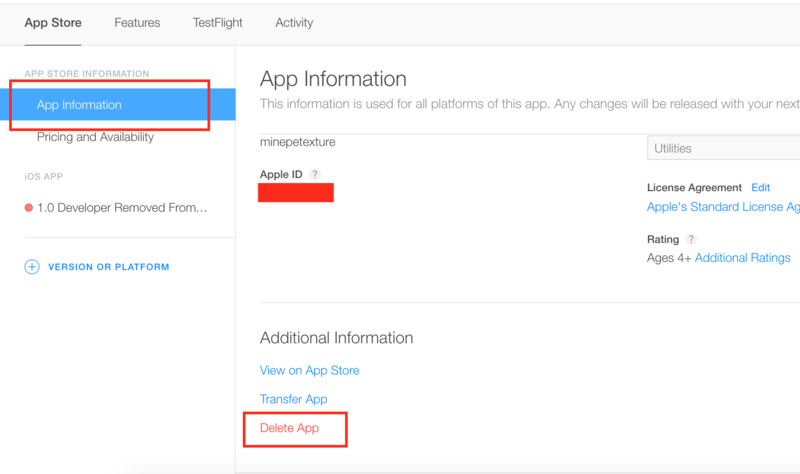 As the instructions state on the iTuneconnect Developer Guidelines you need to ensure that you are the "team agent" to delete apps. This is stated in the quote below from the developer guidelines. If the Delete App button isn’t displayed, check that you’re the team agent and that the app is in one of the statuses that allow the app to be deleted. I have just checked on my account by logging in as the main account holder and the delete button is there for an app that I have previously removed from sale but when I have looked in as another user they don't have this permission, only the main account holder seems to have it. You Can Now Delete App. On October 4, 2018, Apple released a new update of the appstoreconnect (previously iTunesConnect). 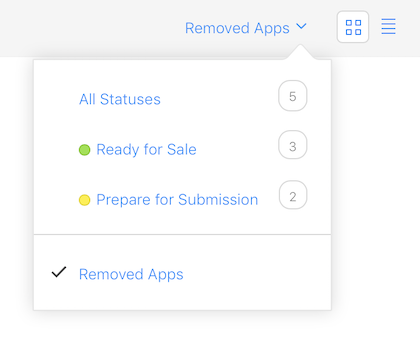 It's now easier to manage apps you no longer need in App Store Connect by removing them from your main view in My Apps, even if they haven't been submitted for approval. You must have the Legal or Admin role to remove apps. From the homepage, click My Apps, then choose the app you want to remove. Scroll to the Additional Information section, then click Remove App. In the dialog that appears, click Remove. You can restore a removed app at any time, as long as the app name is not currently in use by another developer. From the homepage, click My Apps. In the upper right-hand corner, click the arrow next to All Statuses. From the drop-down menu, choose Removed Apps. Choose the app you want to restore. Scroll to the Additional Information section, then click Restore App. You can show the removed app by clicking on all Statuses on the top right of the screen and then select Removed Apps. Thank you @Daniel for the tips. you can only remove apps if all versions of that app are in one of the following states: Prepare for Submission, Invalid Binary, Developer Rejected, Rejected, Metadata Rejected, Developer, Removed from Sale. Apps can’t be deleted if they are part of a Game Center group, in an app bundle, or currently displayed on a store. 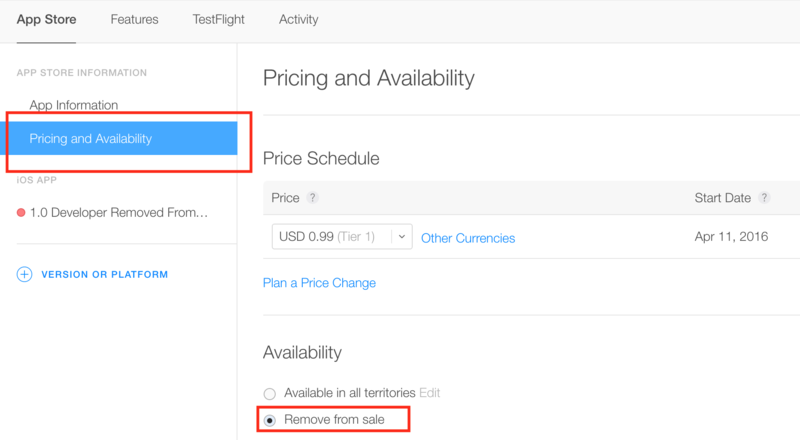 You’ll want to remove the app from sale or from the group if you want to delete it. As per 2018 in App Store Connect. We can delete/remove application with following stats. So, from now onwards we can delete our test applications too from app store connect. Not the answer you're looking for? Browse other questions tagged ios itunesconnect appstoreconnect or ask your own question. How to delete an app which is waiting for upload? iTunesConnect New UI - How to delete Bundle of three apps created in iTunes? How to access the reviews of old version of an app in itunesconnect?